When observing in the neighborhood of R Sct, observers are encouraged to take a look at the young open cluster of M11 (NGC 6705) located just a degree southeast from the variable. Image provided courtesy of the Anglo-Australian Observatory. The RV Tauri-type variable R Scuti was discovered in 1795 by the English observer E. Piggot, when only a handful of variables were known to exist. This finding followed in a parade of well-known variables, including: omicron Cet (Mira), beta Per (Algol), chi Cyg, R Hya, R Leo, beta Lyr, delta Cep, eta Aql, alpha Her, and R CrB (with the exclusion of novae) and has since joined the ranks of stellar popularity. R Sct lies about 1 degree northwest of the Wild Duck Cluster (NGC 6705, M11), just on the northern edge of the Scutum Star Cloud. At maximum, this mighty variable shines at a magnitude of about 4.5, a magnitude which is visible with the unaided eye. Even as the star fades to its deepest minimum at 8.8, R Sct can be found by obervers with even the most modest equipment. The AAVSO International Database currently contains over 110,000 observations of this erratic star spanning nearly a century of activity. Being one of the brightest of the RV Tau-type stars, R Sct has been a long-time favorite of many an AAVSO observer. RV Tauri stars consist of a small but interesting class of pulsating luminous yellow supergiants. Such stars are generally found among the older Population II-type stars and are seen to congregrate in the galactic halo or disc. Several stars of this class have been found to exist in globular clusters, and hence, their distances are fairly well known. According to Wahlgren (1993) no RV Tau stars have been found in open clusters, associations, or the Magellanic Clouds. Nor have any been found to be members of a binary star system. The H-R diagram with the approximate location of the RV Tau variables indicated in yellow. Discovered independently by Danish astronomer E. Hertzsprung in 1911 and American astronomer H.N. Russell in 1913, the H-R diagram displays the correlation between spectral type (and hence temperature) and the luminosity of stars. RV Tauri stars seems to lie somewhere between the Cepheid and Mira-type variables. It is believed that by studying this class of stars we can learn more about the transition between two important phases of stellar evolution. According to Jura (1986), "the RV Tauri stars are probably the low mass, and at least in some cases the low metalicity portion of those stars in transition from the asymptotic giant branch to white dwarfs. Because of their previously high mass-loss rates, many will probably become planetary nebulae." Others, however, may evolve so slowly that the envelopes may dissipate before becoming photoionized. Since the transition from the asymptotic giant branch (AGB) to the white dwarf stage of stellar evolution is not well understood, RV Tauri stars stand as a potential bridge across this evolutionary gap. This post-AGB phase of stellar evolution is short, astronomically speaking, lasting only a few thousand years. "For some mysterious reason, the name RV Tauri seems to have had a special appeal for many persons interested in variable star astronomy and it was almost a fashion, about ten years ago, to call any semiregular variable with somewhat indefinite characteristics an RV Tauri star." Confusion in classification is almost synonymous with RV Tauri stars. Misidentification with the red semiregular (SRc) variables, the yellow semiregular (SRd) variables, and with the photometric properties of the W Virginis class have been common and numerous. These stars have characteristic light variation that show an alternating pattern of deep (primary) and shallow (secondary) minima, with the amplitude varying by as much as 4 magnitudes. The period is defined as the interval between two deep minima and ranges from 30 to 150 days, linking them to the long-period Cepheids and the short-period Miras. They are typically of spectral type F to G (comparable to Cepheids) at minimum and G to K at maximum (earlier than the spectral type of Miras). It is this later spectral classification of RV Tau stars which separate these from the SRc stars, as SRc stars fall into the preceding two criteria. In addition, RV Tau stars also exhibit characteristics of luminosity class II-Ib and occasionally Ia. RVa - variables of RV Tauri type that do not vary in mean magnitude. R Sct is an example of this type. RVb - variables of RV Tauri type that periodically vary in mean magnitude with periods of 600 to 1500 days (or more), with amplitudes up to 2 magnitudes in V. RV Tau is an example of this type. A portion of the light curves for the RVa star, R Sct, and the RVb star, RV Tau, from the AAVSO International Database. In 1963, Preston et al. 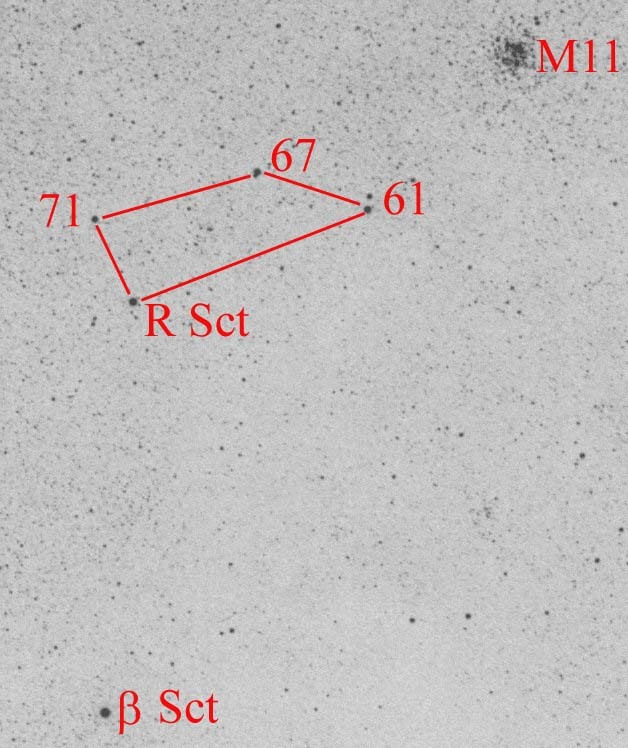 performed a spectroscopic and photometric study of RV Tau stars which resulted in three distinct groupings based on spectroscopic properties, designated by the letters "A," "B," and "C". Stars of the A class typically include spectral types of G or K, may present irregularities in the strength of the CH and CN bands, and show titanium oxide (TiO) bands at minimum. The B stars are generally carbon-rich, with weak metallic absorption, and show strong bands of CH and CN between the secondary and primary maximum. The C class stars display weak metallic lines and resemble the B class, but with the absence of the CH or CN bands. It is believed that the stars of class A are younger and more rich in metals than those of the C class. In 1979, Dawson further subdivided the A-type stars such that A1 stars exhibit TiO near minimum, while type A2 type do not. An artist's rendition of the Infrared Astronomical Satellite (IRAS) in orbit. Through infrared studies, it has been found that RV Tau stars possess a large infrared excess. This type of excess is generally associated with a circumstellar dust shell, which may be initiated by pulsation via a shock wave. Based on the seemingly smooth transition between the RVa and RVb stars, Lloyd Evans (1985) proposes that perhaps the two groups are not physically distinct. "The RVb stars may be in an active phase in which the dust shell is replenished by dust formation close to the star...The dust may be swept out with this gaseous outflow, and in the absence of fresh dust production the star will become an RVa, with a much less dense shell." The RVa-type stars may, in fact, have thinner dust shells or have concentration of dense dust located at large radii. As an alternative, perhaps the two classes may be successive evolutionary processes. Jura (1986) points out that "analysis of IRAS data shows that the mass-loss rate from RV Tau stars has apparently significantly decreased during the past ~500 yr...It seems likely that these stars have just evolved from the phase of rapid mass loss, characteristic of the last stages of the asymptotic giant branch." In the very late stages of the AGB, stars undergo extensive mass loss which result in circumstellar envelopes. In the case of RV Tau stars, the consensus is that mass is not currently being ejected. Although the exact nature of RV Tau stars is still unknown, many theories have been proposed to explain the mechanism behind the variations. One of the earliest theories came shortly after the discovery of R Sct by E. Piggot, whereby he suggested that variation detected in R Sct may be the result of a rotating sphere blotted with light and dark patches. Currently, it is thought that the underlying variability arises from pulsations, with the alternating light curve rising from a 2:1 resonance between the fundamental and first overtone modes. The cause of the light output may arise from at least two separate episodes of atmospheric shocks, which is supported by spectroscopic features. This process is similar to Mira-type stars, and thus, further supports the idea that RV Tau stars may be an evolutionary link (Cardelli and Howell 1989). Studies by Fokin (1994) predict that two shock waves are produced during each cycle. The primary shock wave is higher in amplitude, while the second shock is weaker and is generated just prior to the secondary light minimum. Based on the analyis of these fascinating stars, it has been proposed that low-dimensional chaos could play a role in observed light variations (Kollath 1990, Buchler et al. 1996). Buchler et al. (1996) suggest that "The successful reconstruction of the dynamics of R Sct shows that the large-amplitude irregular stellar variability is no longer a mystery...the mechanism for the irregular variability of the Population II Cepheids is low-dimensional chaos that arises simply and naturally in the dynamics of the star." Excited with the results, the author continues to note that "the properties of the irregular pulsations can be used to probe the stellar interior and to provide new insights to stellar structure and evolution." "A good friend of many variable star observers, R Scuti, belongs to the RV Tauri group...this star is a good example of a very fancy light curve." R Sct is the brightest of the RV Tau class, and based on its photometric and spectroscopic features it is a member of the RVa class, and is placed as a Preston type A star. R Sct has a primary period of about 144 days, and as an RVa star it does not exhibit long-term variations. R Sct shows strong TiO lines which arise as the star fades to a magnitude below 5.8, but tend to be absent throughout much of the remainder of the cycle. Bright Hydrogen lines appear during maximum, which turn to absorption after the star attains peak magnitude. According to Pollard et al. (1997) "The emission following the primary light minima is associated with the primary shock wave. This appears to be stronger than the emission associated with the secondary shock which follows the secondary light minima." Based on spectroscopic data taken during the deep minimum of 1981, Howell et al. (1983) state that "what is seen at deep minimum is a bewildering array of dozens of narrow emission features, as well as extremely strong TiO bands (typical of spectral type M2-M4)." This emission feature, according to Howell et al., is presumed to originate near the stellar surface, rather than by a wind or an extended atmosphere. This fantastic display of emission lines appears to fade as the star brightens. Click on the above image to view the long-term light curve of R Sct. In 1985, Wing found R Sct to be of record-breaking strength with a correspondance to spectral type M5.3. Apparently the star had only once before been seen to reach as late as M5 during the deep minimum of 1932. Continued monitoring by Drs. Wing and Wahlgren showed that the star had maintained its TiO bands well into maximum! It has been suggested (Howell et al. 1983) that the spectral behavior of R Sct at minimum resembles that of the R Coronae Borealis (RCB) stars. The two classes of stars have photometric similarities, as they generally appear bright with abrupt and deep fadings to minimum. Both classes of stars fade by 3-7 magnitudes in just about one month and can stay at minimum for weeks (RV Tauri stars) to years (RCB stars). In addition, both the RV Tauri and RCB stars are known to be enshrouded in a shell of circumstellar dust. Could there be an evolutionary link? A study by Percy et al. (1991) focused on the changes in the periods of RV Tauri stars. A look at over a century of observations of R Sct resulted in the finding that an abrupt decrease in period occured, a feature which appears to be consistent with the predictions of the pulsation-evolution models. Percy et al. (1991) showed that R Sct underwent a sudden period change in 1941, whereby the period changed from 70.95 to 70.0 days. "If they [RV Tau stars] are post-AGB, then their pulsation periods should be decreasing at a detectable rate, due to the fast evolution toward higher temperatures and smaller radii." The field of R Sct with the bright objects beta Sct and M11 (NGC 6705), as well as three comparison stars from the AAVSO chart shown. Image taken with the Papadapolous Atlas camera, courtesy of Charles Scovil. Being one of the brightest of the RV Tau class of stars, R Sct is a favorite with observers. R Sct is relatively easy to find with the aid of two bright objects located within a degree of the variable. With beta Sct situated 1 degree south and the open star cluster M11 (NGC 6705) placed 1 degree southeast, the pattern of four stars including the variable becomes apparent and identification is fairly obvious (see image to the left). Positioned at nearly an equatorial locale, R Sct is attainable by northern and southern observers alike. This variable is a great star for beginners and for those interested in adding this class of star to their program. Refer to our list of Stars Easy to Observe for this and other interesting stars. If you would like to add R Sct to your program, you should plan to observe it once a week. The Julian Date should be recorded to at least one decimal place. Observations may then be compiled and submitted to the AAVSO. Be sure to indicate the chart scale and the comparison stars that have been used in making your observations when filling out your report. In summary, RV Tauri-type stars are a sparsely-populated class with just over 100 known members. Historically speaking, this type of variable has been one of the least researched classes of stars. However, one should not equate lack of literature with unimportance, for RV Tauri stars may prove to be an important link in stellar evolution. With continued monitoring of these stars, more and more can be learned about this class of variables and their potential link in the stellar evolution process. In a paper published in the 75th Anniversary edition of the Journal of the AAVSO (JAAVS0), Robert Wing notes that "it would be useful if interested observers would "adopt" a few RV Tauri stars, observe them at frequent intervals, and aim for the highest possible consistency." Dr. Wing also suggests that not only should such stars be monitored visually, but also by measuring narrow band indices as well. See Dr. Wing's paper listed below for more information on pursuing such a project. Perhaps you will choose R Sct as your new RV Tau adoptee! Fokin, A.B. "Nonlinear Pulsations of the RV Tauri Stars." Astronomy & Astrophysics, 292, 1994, 133-151. Jura, M. "RV Tauri Stars as Post-Asymptotic Giant Branch Objects." The Astrophysical Journal, 309, 1986, 732-736. Percy, John R., Dimitar D. Sasselov, Amy Alfred, and Greg Scott. "Period Changes and Evolution in RV Tauri Stars." The Astrophysical Journal, 375, 1991, 691-695. Percy, John R., Michael Bezuhly, Monica Milanowski, and Endre Zsoldos. "The Nature of Period Changes in RV Tauri Stars." Monthly Notices of the Royal Astronomical Society, 109, 1997, 264-269. Pollard, K.R., P.L. Cottrell, P.M. Kilmartin, and A.C. Gilmore. "RV Tauri Stars - I. A Long-Term Photometric Survey." Monthly Notices of the Royal Astronomical Society, 279, 1996, 949-977. Pollard, K.R., P.L. Cottrell, P.L., W.A. Lawson, M.D. Albrow, and W. Tobin. "RV Tauri Stars - II. A Spectroscopic Study." Monthly Notices of the Royal Astronomical Society, 286, 1997, 1-22. Preston, G.W., W. Krzeminski, J. Smak, and J.A. Williams. "A Spectroscopic and Photoelectric Survey of the RV Tauri Stars." Astrophysical Journal, 137, 1963, 401-430. Wahlgren, Glenn M. "The RV Tauri and SRd Variables." in Sasselov, Dimitar D., ed., Luminous High-Latitude Stars, ASP Conference Series, Vol. 45. San Francisco: BookCrafters, Inc., 1983. ISBN 0-937707-64-3. Wing, Robert F. "Recent Work on RV Tauri Stars." Journal of the AAVSO, 15.2, 1987, 212-219.